Israeli soldiers invaded, on Monday at dawn, the ‘Aida refugee camp, searched several homes and kidnapped two teenagers from their homes. The soldiers also assaulted and injured a Palestinian from Jenin. 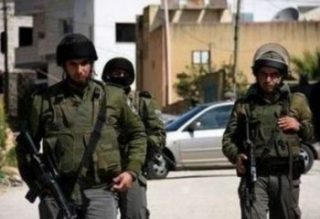 Local sources said the army surrounded Aida refugee camp, north of Bethlehem, before several military vehicles invaded it, and the soldiers stormed and violently searched many homes, and kidnaped two teenagers. The two kidnapped teenagers have been identified as Mohammad Khaled al-Kurdi, 17, and Sayyed Mohammad al-Jabiri, 17. On Sunday evening, the soldiers assaulted a young Palestinian man from the northern West Bank city of Jenin, as he was trying to enter Jerusalem. Medical sources said the young man, Ahmad Mohammad Abu Zahra, suffered various cuts and bruises and was moved to the Palestinian Medical Complex in Ramallah. In related news, the soldiers continued their strict siege and collective punishment on Sa’ir and Bani Neim town, in the southern West Bank district of Hebron, for the eleventh consecutive day, and kidnapped six Palestinians.